It's Here or I guess I should say They're Here!!!!! Surprise, it is a 2 for 1 special this time around!! 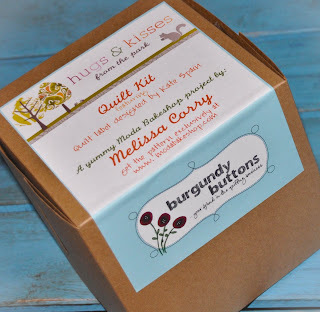 So after all the sneaky peeks I am so happy to say that my Hugs and Kisses from the Park tutorial is out at the Moda Bake Shop today!! Yippee Skippee!!! And lastly, I wanted to leave you with a little tidbit from the tutorial about where the inspiration for this design came from . . . Growing up, we visited Grandma and Grandpa each summer and the trip was always filled with lots of laughs and more importantly, lots of love. Our favorite to do was to play at the park across the street with Grandma and Grandpa. When I saw Kate Spain's collection of Central Park I knew I wanted to design something inspired by my grandparents. Grandma and Grandpa would always sign letters to me with XOXO. My mother explained that it meant hugs and kisses. I always cherished those little X's (kisses) and O's (hugs) from my grandparents. And that is how Hugs and Kisses was inspired. I love you Grandma and am thinking of you and Grandpa often!!! Sending lots of XOXO your way!! And here is Block One designed by John of Quilt Dad. He calls it Flying Over Fields. I am loving the way this block turned out. And a final reminder . . . Check back tomorrow for my Newest Moda Bake Shop Tutorial. I can't wait!!! Alright, lets get right to it. Oh, and one of these days I am going to figure out how to add the little Random.Org generator boxes. Every time I try and cut and paste them they just go back to their original look, without the generated number. If anyone knows how to do this, I would appreciate the enlightenment. She choose #2 first so she will be recieving the Custom Appliqué. And if you didn't win, don't be sad . . . I have a prize for everyone!!! Come back Thursday when my next Moda Bake Shop tutorial will be released. Don't you just love free tutorials? I know I do!! I am so super excited about this new pattern. I will leave you with this hint . . .Kate Spain and Central Park!! Oh ya!!! So this week Amy had her One Thing One Week Challenge. I love when Amy does these!!! They always get me into super sewing mode. This week was no exception, in fact, it was probably the biggest One Week Challenge I have set for myself. My goal was to finish my twin size quilt top for my February Moda Bake Shop tutorial. The reason this goal was so huge was because as of Monday I had 1 block of 20 done. Thus began the sewing marathon!!! Oh did I have fun!!!! Here is a sneak peak of a "portion" of the block (Ya, I am a tease, you'll have to wait till the end of February to see the rest :) I am so happy to say that as of Saturday morning the quilt top was done . . .Ya, Goal Completed!!!!! But of course, when I get a quilt top all done I just can't wait to get it finished. I love free motion quilting and had some pretty specific ideas of how I wanted to do this quilt up. 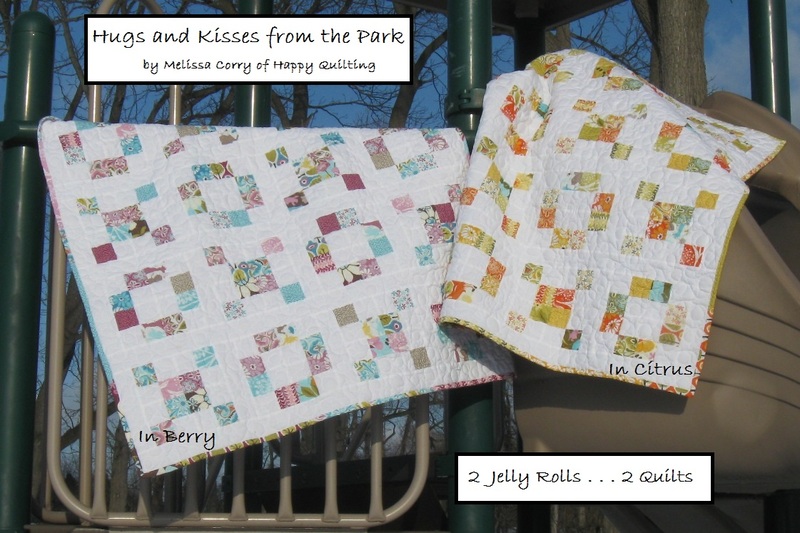 So Sunday afternoon began the free motion quilting marathon. It went into the late hours of Sunday evening :) Just before midnight the dryer buzzed and the quilt had that wonderful finished snuggle me feel. Oh, I am so super happy for how it turned out. I am so excited about this quilt. Want to see the quilting?? I had to laugh a bit when I was thinking about my WIP to post because I think I currently have 8 things on the drawing / cutting board and 1 actual work in progress. 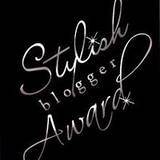 I am blown away at how quickly this little blog is growing!! I started this blog on July 11th of last year. So just over 6 months and I find there are over 300 people that are interested in my day to day quilt dabbling. Wow!!! All I can say is Thank you, Thank you, Thank you!!! And the best way to say Thank you is with a giveaway, right!!! Since we are at 300 followers I figure it is best we have 3 opportunities to win. I tried to mix it up a bit. I hoped to find something on our vacation but we never dared venture outside the resort, ah well. Okay, enough side track, here they are. I will close the giveaway Monday night (24th) and use Random.org to choose the winners. Winners will be announced Tuesday Morning (25th). 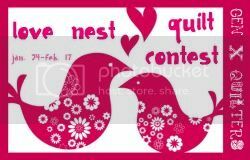 Good luck to everyone and have a Happy Quilting day!!! 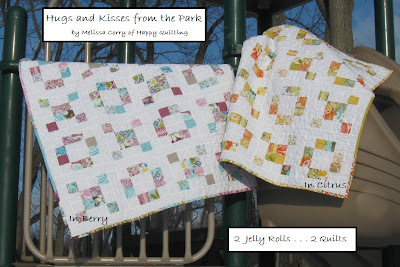 So is it just me or has there been some super cute table runners popping up in quilt blog land over the last few weeks. I have a few holiday table runners that have been made for me and I have made several that I have given away, but I don't have any that I have made for myself. (Isn't that the way it always is :) So last week I decided it was time to change that up. So I pulled out all of my holiday scraps and started cutting charm squares. I ended up with a rather large pile of prints and several squares of each print. More than enough to whip something up with. Well I am back!! My sweet husband and I spent the last 4 days in the beautiful sunshine of Montego Bay. It was a wonderful trip and a super nice way to celebrate our 10th anniversary. We tried lots of new water activities including snorkeling and sailing which I throughly enjoyed. And we ate, and ate, and ate!! It was so nice to just spend time relaxing and enjoying. And now the snow here has kicked me back into reality, so here it goes. What is even more fun and exciting, is that you will notice in the write-up a certain mention of doing this as a Quilt-A-Long come February. That's right, I am making it official!!! I am planning a quilt-a-long of this quilt, or a similar variation to it some time next month. I am super excited about this. Half square triangles are such a versatile little piecing block and can give you so many different variations. This tutorial will go through the basics of cutting, creating, and trimming Half Square Triangles. Start with cutting your squares. 2 squares of different fabrics make 2 half square triangles. You want to cut your squares 1/2" larger than you want your unfinished half square triangle or 1" larger than your finished half square triangle. (same thing just depends on how you like to calculate your sizes.) So in this example, I will be making 2" finished half square triangles so I will cut my squares 3" x 3". Also, you are almost always making half square triangles in a mass quantity so cut all of your squares to start and then to save time be sure and repeat each of the sub-steps for making your HST's in an assembly line fashion. Lay your dark square on your light square with rights sides together. Pin both sides of each square adjacent to that drawn line. Make sure to put them out far enough that your presser foot won't hit them as you sew on by :) Now stitch a 1/4" seam along both sides of the drawn line (the black lines represent your stitching lines :) Remember, you are doing these assembly line so go ahead and chain stitch all the sets on the right hand side of the line, and then go back and do all the sets on the left hand side. Now press towards your darker print. And now you are ready to trim up your HST. You will trim to your pre-decided unfinished size. (1/2 smaller than you started with) In this example I am trimming to 2 1/2". Start by aligning the 45 degree line on your square ruler with the seam line on your half square triangle. Make sure that the raw edges of the half square triangle are over the 2 1/2" line's on your ruler. Trim the 2 sides along the edge of the ruler. Now spin your block 180 degrees. Once again, align the 45 degree line on your ruler with the seam line on your half square triangle. Align the raw edges of the half square triangle under the ruler on the 2 1/2" lines on your ruler. Trim the 2 sides along the edge of the ruler. If you don't have a square ruler you can use your long ruler to trim like so . . .
Once again, You will be trimming your half square triangle to a 1/2" smaller square than you started with. So, since this started as a 5" square, I will be trimming it to 4 1/2". To do this, align your ruler so that the 45 degree line is along the diagonal seam of your block and that the left side edge is on the 4 1/2" line of your ruler. Trim the excess on the right that is sticking out. Okay, so how many of your get scared and run for the hills at the through of flying geese. They can be a little intimidating :) This is a great method of making Flying Geese that have no waste. And you won't be sewing any triangles along the bias which helps to keep everything nice and straight. It's simply sewing down the center of squares. Let's get to it!!! To start you need to cut your squares!! Each set of squares cut (5 total) will make 4 flying geese. From your first fabric (the goose or large triangle) you will cut a 1 square that is 1 1/4" larger than the finished width of your flying geese block. From your second fabric (the sky or small triangles on the sides) you will cut 4 squares that are 7/8" larger than your finished height of your flying geese block. Just make sure that when you are picking your sizes your keep your geese proportional to twice the length as the width (ie 2 x 4, 2 1/2" x 5", 3 x 6, ect. So in this example picture I am making 4 sets of flying geese (12 green geese and 4 red geese). My finished geese blocks will be 2" x 4". By finished I mean the size they will be when sewn into a block. When I am done making the individual geese block they will measure 2 1/2" x 4 1/2" and are considered unfinished. (a little confusing some times :) So I have cut (4) 5 1/4" x 5 1/4" squares (4" + 1 1/4") and (16) 2 7/8" x 2 7/8" (2" + 7/8") squares. I will end up with 16 flying geese unfinished at 2 1/2" x 4 1/2" and when I sew them into a block they will be finished at 2" x 4"
Oh, and one last note before we start sewing, since you are almost always making this block as a flock (aka a lot of them) it is best to save time to do all of your cutting first and then be sure and repeat each of the sub-steps in an assembly line fashion rather than making 1 set of geese at a time. With right sides together, lay two white squares onto your large print square as shown. Using your ruler, draw a pen line diagonally from the top left corner to the bottom right corner. Now go ahead and pin both sides of each square adjacent to that drawn line. Make sure to put them out far enough that your presser foot won't hit them as you sew on by :) Now stitch a 1/4" seam along both sides of the drawn line (the black lines represent your stitching lines :) Remember, you are doing these assembly line so go ahead and chain stitch all the sets on the right hand side of the line first, and then go back and do all the sets on the left hand side. Now you will want to press your seam up towards your 2 little triangles. Now, take 2 more little squares and align them on your two stitched pieces as follows with right sides together. Once again, draw a diagonal line on the wrong side of the little squares from corner to corner. Clip your threads and then using your ruler aligned along the drawn line, once again, cut your 2 separate pieces apart. Press up toward the little triangles again. Lastly, trim off the little corners.